During the last 3 months ShopUp Customer Behavior Analytics platform has focused to malls and shopping centers, finalized the product, start on-boarding new customers and generate constant revenue. Below you can read more about our progress. The ShopUp platform now offers an all-in-one solution for Malls and Shopping centers. We’ve created a complete tailored solution where we combined data from Door Counters, Wi-Fi Routers, Mobile Apps and other hubs into an all inclusive Customer Behaviour Analytics Platform. Now Mall owners, marketers, and analysts can see the data in one place and make decisions based on 360 degree view. 12 Malls have been on-boarded to the new platform and 20 more are in the pipeline. We started generating recurring revenue stream. We were part of the biggest Retail Conference: NRF in New York — where we met great people and learned a lot about the newest trends in the industry. Router Integration: ShopUp has been integrated and now works with Cisco Meraki Routers. Cisco Meraki represent 83% of Wifi routers in the malls and shopping centers globally. 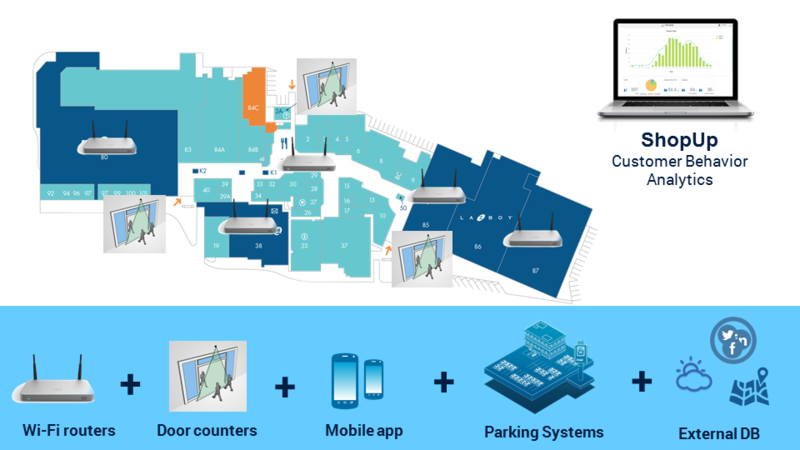 The platform is integrated with additional 1000+ WiFi router devices and data collection can be activated remotely, without the need of physical installation. Video Counters Integration: We’ve integrated and can now collect data from Xovis and Nortech video counters. Xovis and Norther are the industry standards on the market. Mobile apps integration: We are in the process of integrating mobile and online data and provide full customer behaviour analytics with SAP Hybris. New Visualizations: We launched new cross-zone movement and customer patterns visualization functionality on the Analytics platform. Deep Machine learning is used for better positioning and increasing accuracy. We became an official Xovis partner with main coverage on the Balkans. We work with A1CS (a data solution service provider for Malls in Canada and US) to provide Wi-fi analytics product update to their clients. With A1CS we are working on penetrating the North American market with an integrated holistic Customer Behaviour Analytics solution. We’ve also started discussing entering the Dubai market with a sales representative. And we plan to start active promotion of the product within the SAP partners network. Our team is growing, we are focusing on product and business development to become top 3 company operating in that sector. If you are interested to be part of our team contact us for more details.